Any other New York City restaurant would’ve been shut down for bug infestation, but The Black Ant restaurant in The East Village is gleefully in business. More so, the bugs are on the menu. The little black dots sprinkled over the signature guacamole are neither beans nor peppercorns. They’re chicatanas, black Mexican ants hand-caught in Oaxaca, roasted with garlic and chili and ground into a special black ant spice. Still hungry? Then add a side of chapulines, or grasshoppers, to your guacamole for only eight bucks. In Tacos de Chapulin the critters are inconspicuously tucked among dollops of guacamole and fresh cheese. Fair warning: Don’t poke through your tacos, or you’ll have to resist de-bugging them and flicking off the brown bodies. How’d you tell when you actually chew on one? It’ll instantly fill your mouth with a rich earthy taste. 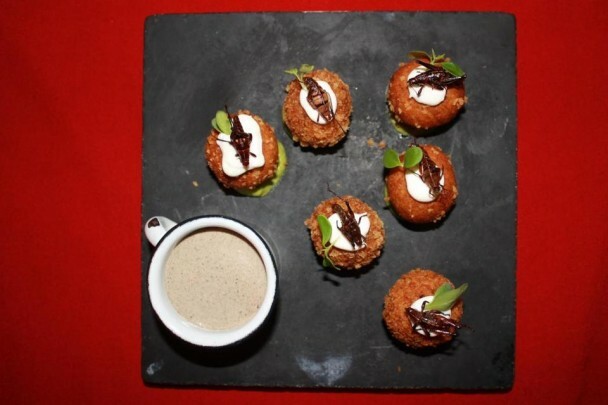 For the brave omnivores, Croquetas de Chapulin is a must. Made from yucca and grasshopper flours, they come decorated with little shiny chapulines, which stick their long legs up in the air like practicing ballerinas.